MY KITCHEN IN SPAIN: TOFU, OLÉ! I’m trying to get tofu to speak Spanish. The truth is, I eat tofu on average every couple of weeks. It’s a way to not eat meat, poultry or fish. I always turn to a few favorite Asian recipes—Stir-fry with Snow Peas, Seared Tofu with Green Beans and Coconut Sauce, Noodle Salad with Tofu and Peanut Sauce. 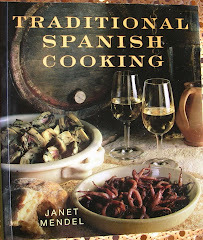 Now I’m trying to figure out how to use tofu in some typical Spanish recipes, turning them, not just vegetarian, but vegan as well. 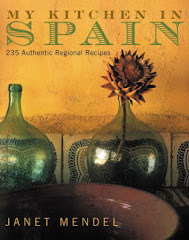 In Spain, where even vegetable, legume and grain dishes usually contain a little ham, pork fat or salt fish, vegan is not an easy call! 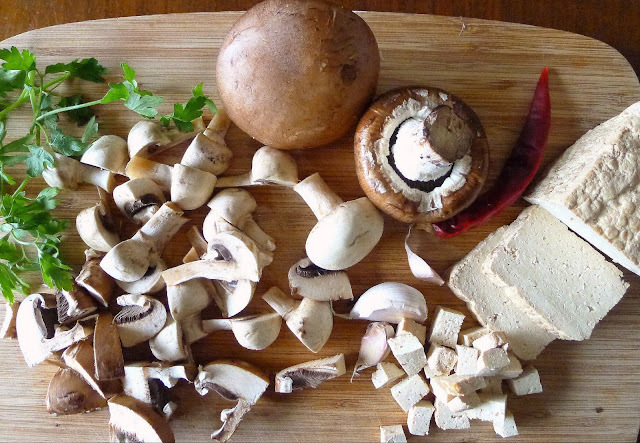 Mushrooms to make a typical Spanish tapa, sautéed with garlic and, in place of ham, diced tofu, on the right. Tofu—a non-dairy “cheese” made from pressed curds of soy milk—has long been available in Spain in “health food” stores. Now it’s also common to find it big supermarkets, in several “flavors.” Besides plain, there are smoked tofu, tofu with Italian herbs and olive-almond tofu. The plain one is almost tasteless, but soaks up flavors with which it cooks. I particularly like the bacon-y smoked variety. Tofu is a fresh and perishable product. Keep it refrigerated and use by expiry dates. Here are a few of my tofu Spanish interpretations. 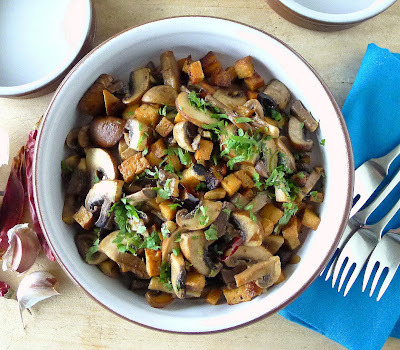 Mushrooms and tofu al ajillo--sautéed with lots of garlic. Tofu and black-bean burger with red-pickled onions and piquillo pepper ketchup. Fideo noodle paella has tofu instead of seafood. 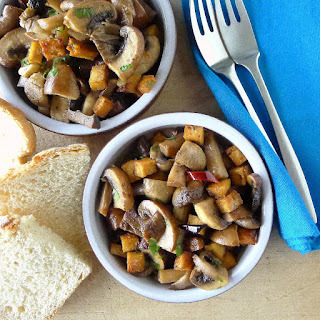 Serve the mushrooms and tofu as a tapa or side dish. Serve with bread to soak up the juices. 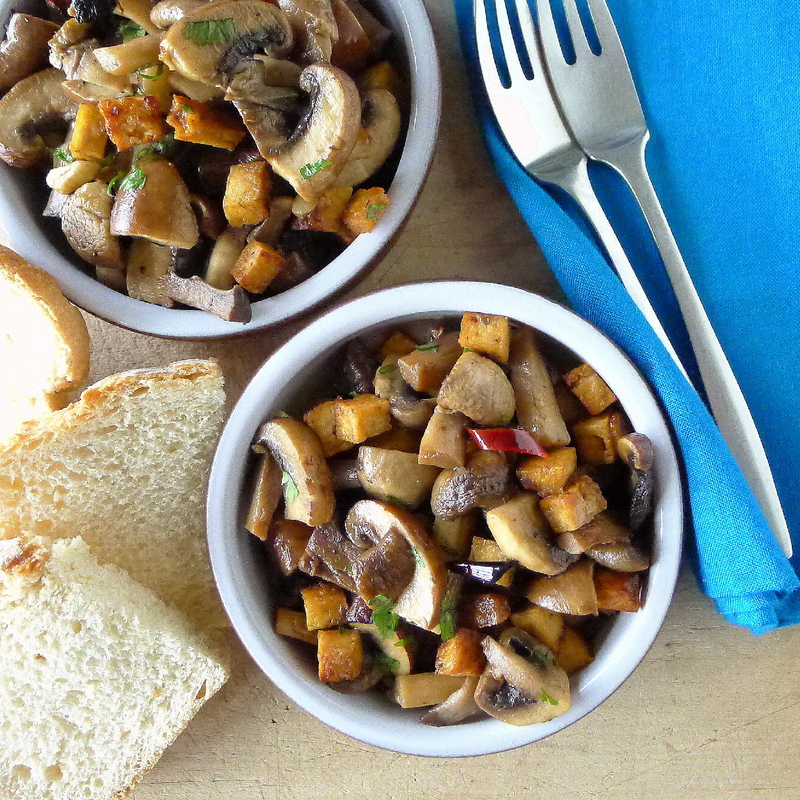 Garlicky sautéed mushrooms are a favorite tapa bar dish in Spain. It usually includes diced ham or bacon. 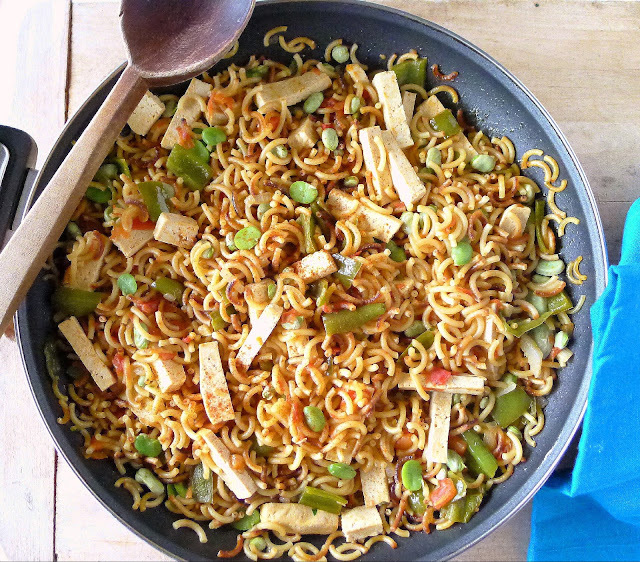 Smoked tofu, diced and fried, is the perfect substitute. 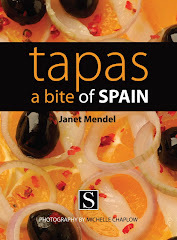 Serves 4 as tapa or side dish. Cut the tofu in 3/8-inch dice. Spread it on a layer of paper towels. Cover with additional paper towels and press to remove as much moisture as possible. Clean the mushrooms in running water and pat them dry. If they are large, cut them in half through the stems, then slice them thickly. Small mushrooms can be quartered. Heat the oil in a large skillet. Add the diced tofu and fry it, turning, until golden. Add the garlic and red pepper flakes and sauté until garlic begins to turn golden, 2 minutes. Add the mushrooms and continue sautéing, about 5 minutes. Add the salt and Sherry and cook 6 minutes longer. Stir in the parsley. Serve the mushrooms hot. 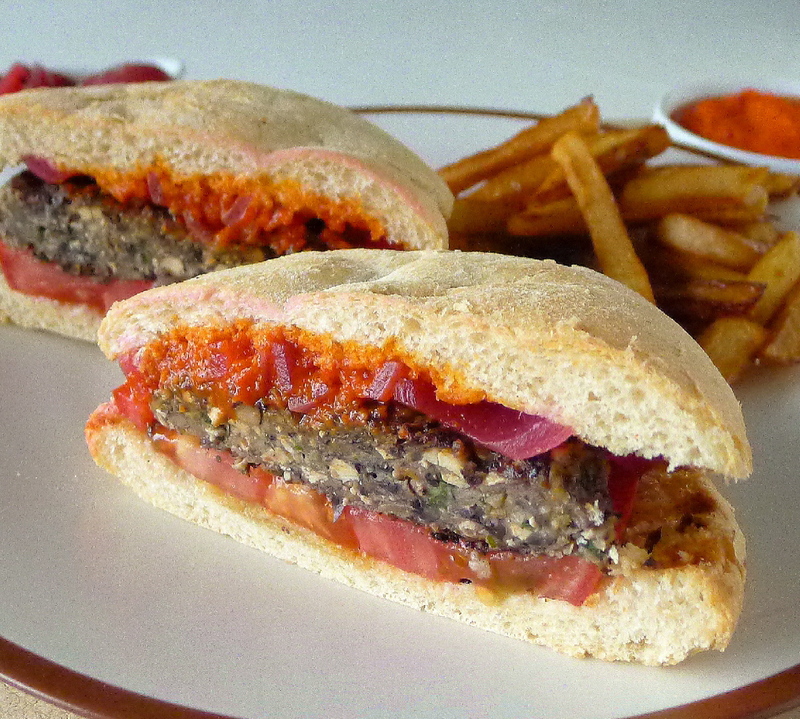 Flecks of tofu, black beans and vegetables show in this juicy burger. 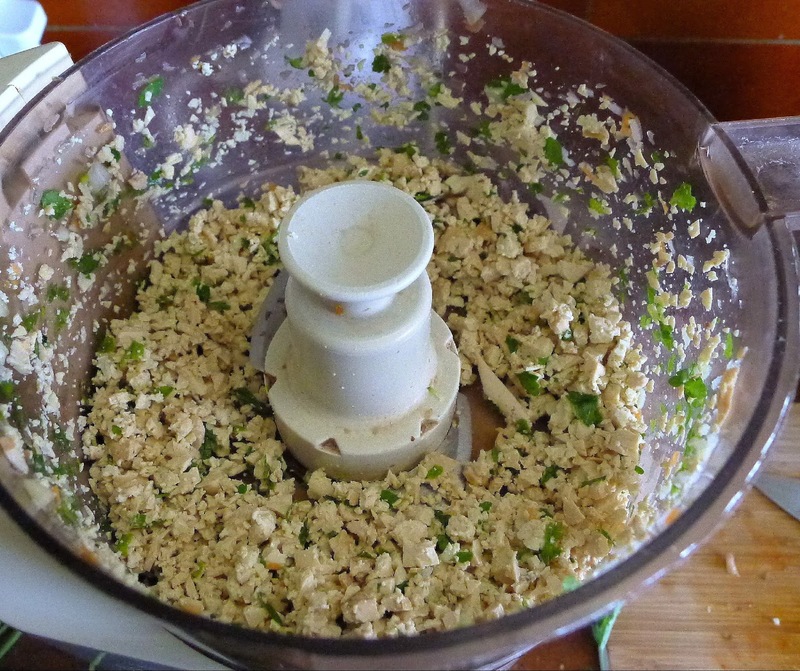 Tofu is especially suited to grinding up with garlic and frying in olive oil, as if it were ground beef. With the addition of smoked pimentón (paprika), it’s a perfect stand-in for chorizo. Cook it with tomato to make a Bolognese sauce for spaghetti. Here, the ground tofu is combined with black beans to make really good burgers. Pat the tofu dry. 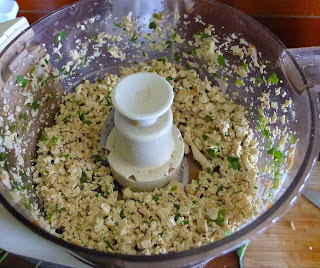 Break it up and place in food processor with the parsley and garlic. Process until the tofu is crumbly. Set aside. Process the carrot, onion, zucchini and mushrooms until finely chopped. Heat the oil in a skillet and sauté the vegetables until they are somewhat softened, about 8 minutes. (Carrots should still be a little crunchy.) Stir the tofu into the skillet and sauté it with the vegetables for 1 minute. Season the mixture with 1 teaspoon salt, pepper, pimentón, cumin, oregano and red pepper flakes. Scrape the vegetables and tofu into a bowl. Process the black beans, leaving them a little lumpy to give the mixture texture. Add it to the bowl with the bread crumbs or oat bran. Mix well with the hands. Chill the mixture. 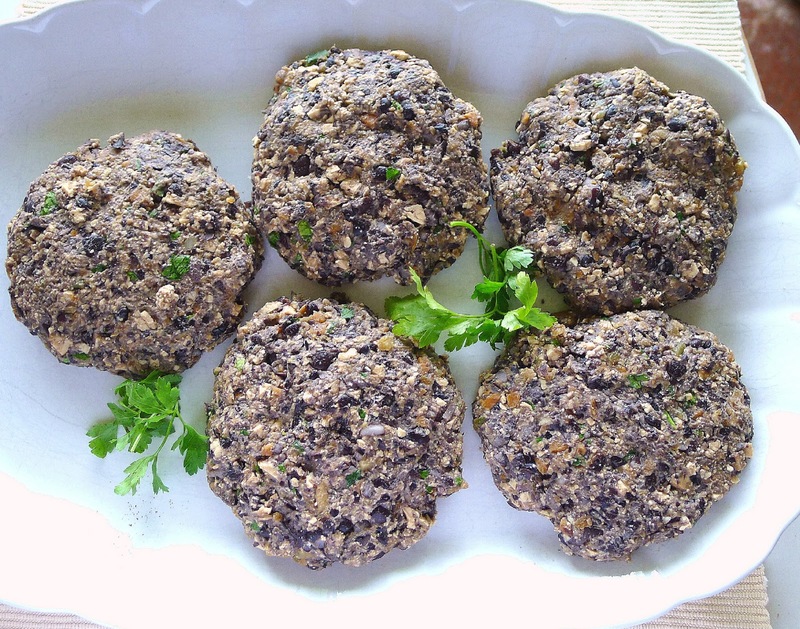 Shape the tofu-bean mixture into patties. These are before cooking. Shape the tofu-black bean mixture into 4 large or 6 small patties. 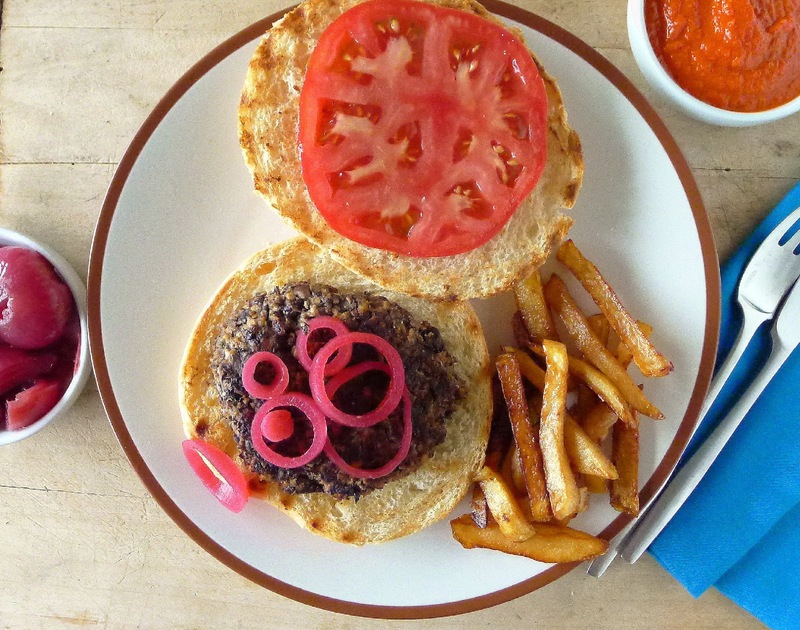 Heat oil in a heavy skillet or plancha and cook the burgers until they are browned on both sides and heated through. 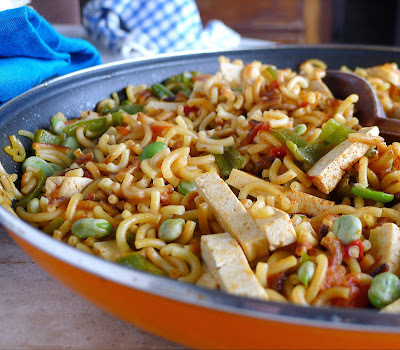 This noodle dish, usually cooked with fish and shellfish, is also known as “pasta paella” or “fideuá.” It occurred to me to make it with tofu because the chewy, white tofu sort of reminded me of pieces of squid or cuttlefish. To give it a taste of the ocean, I made a vegetable stock using kombu, edible sea kelp. (Spain has become one of the world’s top producers of algae and seaweed products.) If you like, cut the cooked kombu in thin strips and add it to the noodle dish. If you don’t want to bother with the kombu, just use any vegetable stock. Fideos (fideus in Catalan) are thin, round noodles, like vermicelli. They range in thickness from threads of angel’s hair to spaghetti-like cords. I’m using short ones that have a pin-hole through the middle. If you haven’t got fideos, use spaghetti broken into two-inch lengths. 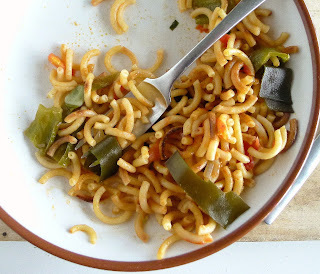 Fry the noodles in oil until toasted. Spanish fideos are cooked differently than your usual pasta. For one thing, the dry pasta is first toasted in olive oil. 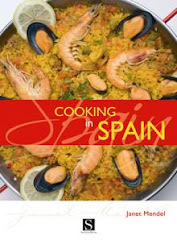 Next, instead of cooking the pasta in a pot of boiling water, then saucing it, the fideos cook right in the sauce, soaking up the flavors, much as rice is cooked in paella. The starting point is a good sofrito—onions, peppers and tomatoes fried in olive oil. This can be prepared in advance or all in one go. Heat the oil in a skillet and sauté the onion, pepper and garlic until onion is softened, 5 minutes. Remove from heat and stir in the pimentón and cumin. Return to heat and immediately add the chopped tomatoes. Cook on high heat for 3 minutes. Add the wine or Sherry and salt. Let the sofrito simmer until thickened, about 15 minutes. Cut the tofu into strips about 1 ½ X ½ inch. Pat them dry. Place the tofu in a small bowl with the kombu or vegetable stock, salt, vinegar, and crushed garlic. Allow to marinate 30 minutes. 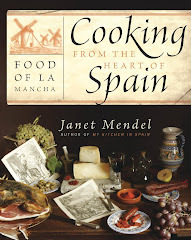 Heat the oil in a paella pan or cazuela. 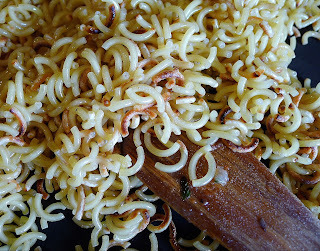 Add the noodles and toss them in the oil until they begin to turn golden. Drain the tofu and add the pieces of tofu to the pan and fry them briefly. Add the fava beans or peas. Stir in the sofrito. Add the stock and bring to a boil. Lower heat and simmer, stirring occasionally, until pasta is al dente. Season to taste with salt and pepper. Remove from heat and allow to set 5 minutes before serving. Garnish with sprigs of mint and thin strips of kombu, if desired. 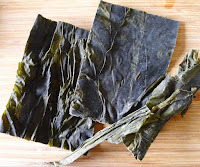 Wash the leaves of kombu. Place them in a pot with the water, onion, celery, carrot, bay, rosemary and salt. Bring to a boil and simmer, covered, for 40 minutes. Add strips of cooked kombu to the noodles if you like. Strain the stock in a colander, saving the cooked kombu, if desired, to add to the fideo noodles..
Brown Rice Paella with Vegetables. and your blog is now featured as one of the best! I hope you like ‘your’ page! 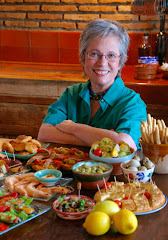 Adrian: Thanks for linking to My Kitchen in Spain on your Mallorca web page. It's always nice to be included with the "best"!